An innovative replacement to conventional grease traps and/or grease interceptors. Our Automated Grease Recovery Devices significantly outperform and outlast all grease traps and grease interceptors on the market. 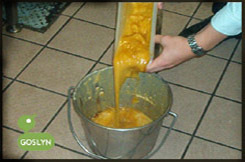 Even food solids are trapped with Goslyn Grease Recovery Devices. Grease Interceptor and Grease trap pumping is permanently eliminated. Automatic Grease traps with stainless steel construction, no moving mechanical parts and superior grease recovery under high volume conditions. 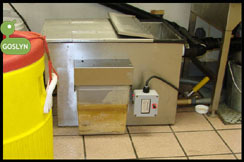 Dominates grease interceptor technology in all foodservice sectors. Recovered Fats, Oils, and Grease (FOG) are recyclable for future bio-diesel (yellow grease). "No trench and minimal installation was required for this grease interceptor. 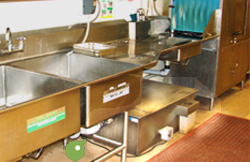 No trap pump-outs or blockages have saved our restaurant franchisees hundreds monthly. Finally, a proven "No Risk" solution to the old rancid interceptors"
"Goslyn Grease Interceptors have provided us with substantial cost reductions. Monthly Pumping and chemical costs are now zero. The Goslyn has given management "Peace of Mind" on their days off"